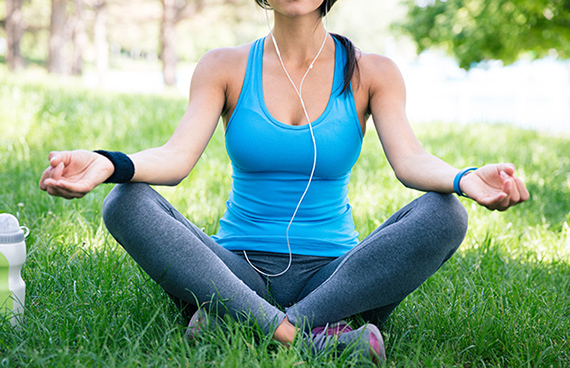 What's the secret to actually making time for meditation? Establishing a meditation routine can be difficult. You're busy! Who has time to breathe, let alone sit and breathe? But if you think the only way you'll learn how to meditate is with a 25-hour day, think again. Plenty of busy people are making time for meditation. Media guru Arianna Huffington makes it a part of her morning routine. Rapper 50 Cent uses meditation to help him remain positive when faced with negative personalities. And Jerry Seinfeld won't let anything get between him and his meditation time -- he allegedly takes time between TV shoots to get zen. "I have a really chaotic schedule so I do it whenever I can," says Dan Harris, a correspondent for ABC News and the author of the New York Times bestseller 10% Happier. "I don't freak out if I can't fit it in but I do think it's important to do something every day." Harris has been meditating ever since he experienced a panic attack on air nearly a decade ago. He credits meditation with helping him control knee-jerk reactions to frustrating situations. Thanks to improved patience, Harris says he's a better listener and is able to hold shorter, more fruitful meetings. Meditation, he says, is "fighting a lifetime pattern of letting your thoughts lead you by the nose." Dina Kaplan, founder of The Path, a weekly meditation seminar in New York City, says meditation allows her to have more "mental agility" during her day. She's much more calm when faced with stress, and feels as though she makes better decisions. And science confirms these benefits: Your brain will actually change if you stick with meditation, just as your body changes when you exercise regularly. You'll be rewarded with improved memory and other cognitive benefits. "Don't put the pressure on yourself that you have to do it forever," Harris says. It's okay if you fall off the wagon for a few weeks, so long as you muster the grit to return to your practice. The power of meditation, he says, is derived from practicing daily. Watch the video below for a short meditation exercise from Happify, featuring Harris and Sharon Salzberg, a meditation teacher and author. So what's the secret to actually making time for meditation? We asked Harris, Kaplan and David Ngo, a behavioral designer at Stanford University and behavior consultant for The Path, for their best tips on how to actually create a meditation habit. 1. Type it into your phone cal. Instead of simply hoping you'll be able to squeeze in meditation on the fly, try setting aside a specific time for it. "If I carve out time to [meditate], that's the space for my practice to go," says Ngo. When you create that space, the habit can grow. But rather than thinking of meditation as another item on your to-do list, think of it as a gift to yourself, says Kaplan. "If you're starting out and you're struggling with developing the habit, I do think you should do it first thing [in the morning]" says Kaplan. She meditates right after she brushes her teeth. By doing it right away, she has no excuse. Especially for parents with young kids, doing it before the day gets underway is your best bet for fitting in some "me time," she says. Kaplan recommends not setting your goals too high in the beginning. "If you can do five minutes, that's better than nothing." 3. Start with one breath. Don't underestimate the power of small behaviors. By focusing on taking one conscious breath when you have a spare moment, you can pave the way for creating a meditation habit. Ngo says this philosophy comes from BJ Fogg, Ph.D., behavioral scientist and founder of Stanford's Persuasive Technology Lab, who pioneered the idea of creating tiny habits. For example, to create a habit of tidying up at home, you might start by making your bed each morning. A tiny habit should be a behavior that requires little effort and can be performed in less than 30 seconds. "That seed of the habit can then grow into a full-blow tree," says Ngo. 4. Perform meditation after an existing habit. After you get into your car for your daily commute, try meditating for a few breaths instead of racing to turn on the ignition. Or quiet your mind after you go to the bathroom at work. "The pattern is always after," says Ngo. "This is called anchoring." Ngo recommends choosing a daily occurrence or existing activity to remind yourself to meditate. 6. Siphon time from superfluous activities. Think about it: Do you really need to hit "reply all" to every email that hits your inbox? "I would have considered myself busy at my last job, but it was just an excuse to procrastinate from what was really important," says Kaplan. As a successful start-up founder and Emmy award-winning producer, Kaplan says she was writing redundant emails and taking meetings that were unnecessary. "If you're answering emails you don't really need to respond to, that would give you 15 minutes," she says. With that extra time, she suggests finding a quiet park bench to relax, or even sneaking into a hotel lobby for a few minutes. 7. Practice mindfulness when you've got time to kill. Resist the urge to scroll through Instagram the moment your friend or dinner date heads to the bathroom. "I think it's very healthy to have all sorts of moments in the day where you're just being," says Kaplan. It's tempting to use our phones as entertainment during those "black spaces" during the day, but Kaplan recommends pausing and just letting the moment happen instead of gluing yourself to your Facebook feed. Look around, smile at other people and enjoy some momentary calm. While it's not the same as doing a seated meditation, being fully present during these small moments can help you feel more comfortable confronting the thoughts rattling around in your mind.